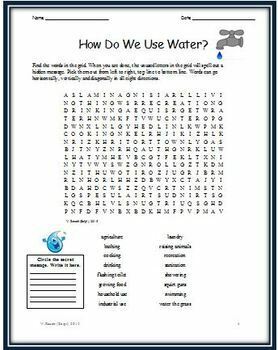 This resource contains two different science word search puzzles about water entitled Forms of Water and How Do We Use Water. 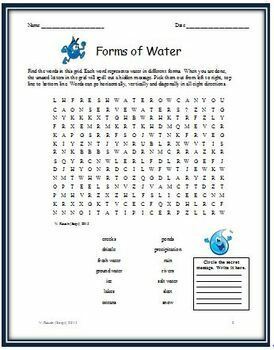 The first puzzle is lists 14 hidden words which represent various forms of water. Also, in this puzzle, is a concealed message. When the 14 words are found, the hidden message appears from left to right. 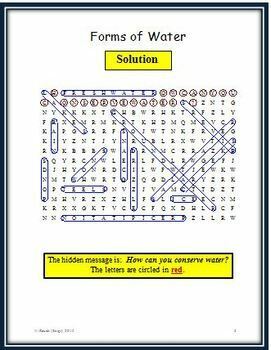 The second puzzle is a standard word search where a list of 16 words must be located in the grid. It is called How Do We Use Water. After the words are uncovered, a secret message can be read from left to right. Both word searches include the solutions. 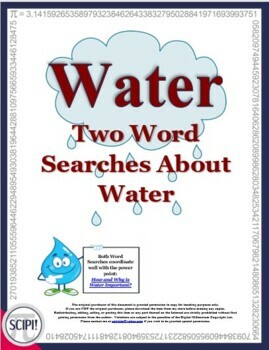 The two puzzles coordinate well with the power point How and Why is Water Important. You also might be interested in these resources about water. To save money, you can purchase the power point, word searches and a crossword puzzle as a bundle.